​Newly opened on the Upper East Side, Imli Urban Indian Cuisine serves up a delicious twist on Indian fare. The Tandoori Pizza or the Scotch Egg Burger are not the only unique items on the extensive Imli menu. Diners also have the option of having a truly Indian tapas experience with small dishes at very reasonable prices. 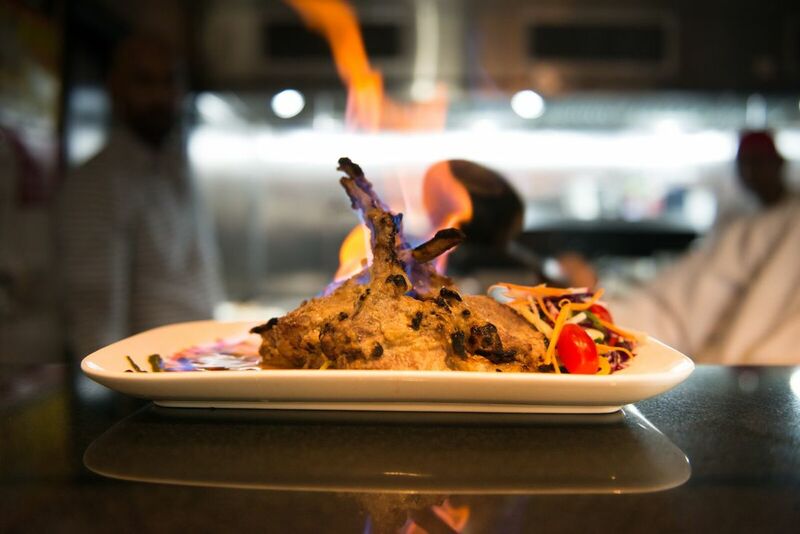 Owners Mervyn Winston, Ram Reddy, and Albin Vincent, have created a different Indian culinary experience with unique preparations of dishes—some rarely seen on an Indian menu and shareable small plates like those found at the bustling all-day cafés of Mumbai. To craft the food menu the team has tapped Executive Chef Manuel Butler, a veteran Indian chef who created a menu offering a range of experiences anchored by colonial Indian cuisine, with influences straddling modern and traditional representing various regions of India. The restaurant space is cosmopolitan chic, with black concrete tables, rust-colored floor, silver studded cerulean fabric chairs, and wood walls adorned with a light. The restaurant decor and ambiance is not your typical Indian restaurant setting and even includes an enclosed, sky lit outdoor patio. ​Each meal at Imli begins with an amuse bouche to stimulate the palate. Guests may then choose from an extensive menu of small plates, best paired with a flight of signature housemade dipping sauces—divided into mild, medium or hot categories—from the list of 20 selections including pear-apple, peanut chutney with mustard seeds, and spicy tomato. Appetizing and unique dishes that break from tradition like Argentinian Shrimp, Kerala Beef, and the Scotch Egg Burger fill up this extensive menu and offers plenty of options for both Vegetarians and Meat-Eaters alike. Other notable dishes on the menu are the Chicken Rezala which features tender chicken pieces in a light coating of flavorful, creamy white gravy made with yogurt, cashew nut/poppy seed paste and Pan-Seared Duck, served with garam masala-spiced cauliflower and potato mash. For vegetarian entrées, the Brussels Sprouts Medley or the Vegetarian Tandoori Platter are our favorite options. Side dishes include a variety of rice from lemon to coconut, to mixed vegetable and paneer pulao, as well as breads like mushroom and truffle naan, and parathas like whole wheat and peshawari with dried nuts and fruit. The cocktails at Imli are just as unique and creative as their entrées! Cocktails are infused with Indian spices in unexpected ways, for instance the "Passion" features Ketel One vodka, mint, jaljeera Indian spice blend, passion fruit, green chilis and club soda. Our favorite, the Imli-Rita is created with tamarind, Avion Tequila, Grand Marnier, lime and cane syrup. The extensive drink menu also includes Indian beers like Taj Mahal and Kingfisher, as well as selections like Heineken and Corona, in addition to a global wine list.